Most knife attacks are knifings, which means they start up close and personal, and not from the distances usually displayed in movies. Knifings are most often done with one arm trying to control you as the other weapon arm stabs in short repetitive strikes like a sewing machine. That is the assault we must prepare for. But just as when learning to hit a baseball we do not start hitting the major-league pitcher’s 90 miles per hour fast ball we must start with easier attacks building the foundation, principles and skills to handle that fast ball. 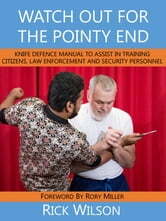 This book presents a system that builds toward the end goal of being able to defend yourself against an all out brutal up close assault. It will outline how your tactics must match our strategy to achieve your goal of survival. Two sets of tactics will be provided based on the four strategies for survival: Escape, Distance and deploy/grab a weapon, disable, and control. The way to use this book is to read and work through the drills beginning with assaults from a step away, then within arm’s reach, then one foot away and finally the brutal sewing machine strike attacks. The system offers techniques and ways to deal with the assaults but within those techniques are the underlying principles that make them work. Retain these and you increase your chances of survival. This book is a manual for the Knife Defence Course I taught at the Alberta Peace Officer’s 2017 Annual Convention. It covers everything taught at that seminar and more.